When the leaves begin to change color it is a beautiful site, but once the leaves fall on the ground it can be an overwhelming task with the leaves falling all over the lawn, landscaping, and driveway. Although when the leaves fall it is a busy time of year for most families with all the holidays. Many are preparing for guests and don’t have the time to take care of all the leaves that have fallen on the lawn. But when you hire Lawn care solutions you can expect a thorough leaf removal service. We will leave your lawn looking nice and tidy after we are done. 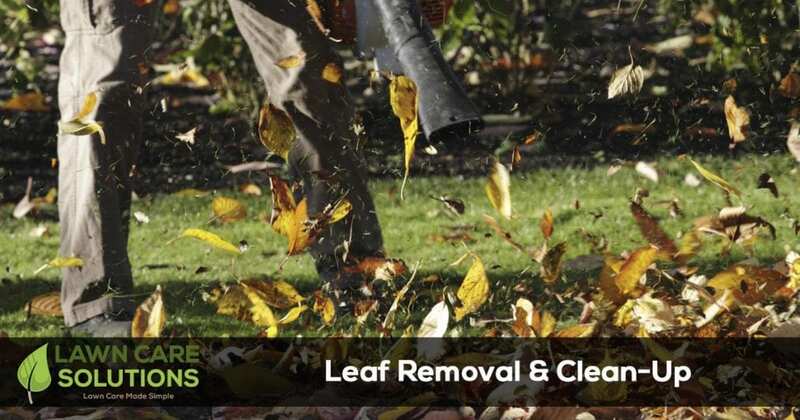 Our leaf removal service consist of collecting the leaves and hauling them away. We also blow out the flowerbeds and blow off the driveway, sidewalk, porch and patio. Depending on the quantity of leaves we may either manually collect them or use our lawn mower with high lift blades to collect the leaves in the lawn with our bagging system. A nice and clean yard also improves your property’s curb appeal and your landscape’s health. Give us a call so we can remove all those leaves off your lawn. We are here for you all year long! Also Every service comes with our 100% Satisfaction Guarantee. If you are not happy with our work, we will send our team to fix the item in question for free. Nothing is more important to us than your complete satisfaction.